Check it out. Can you use each word in a sentence? If you are not sure of a word’s definition, click it. Update: I just finished a quiz to test your knowledge of the 100 words! Click here and see how well you do! Leave your comments below! How many of these words did you know? This site http://wordsinasentence.com/vocabulary-word-list/ has vocabulary sentences for a large number of words you listed. Really helps cement the word’s meaning – at least, it helps me! Hi, Brian. Thanks a lot for all the work you’ve done. I find it very interesting and useful for my work as a teacher of English in China, where many students want to know how many words an average middle school graduate really knows out of the word list. Would you please kindly tell me the results of the quiz or any information regarding my question? Thank you so much! 2188 scored 70% or better. That means about 43% of quiz-takers passed the quiz. Your definition of photosynthesis in the quiz is incorrect. It should state that it is the process by which plants convert sunlight into glucose (energy) and oxygen. Plants use carbon dioxide in photosynthesis they do not produce it. Thank you Jana. I have corrected the quiz. Maybe a list every fifth grader should know? Good idea, Pamela. I’ll see what I can do. I might take this as a challenge to use at least one word a day in a post. There are plenty of important words not on the list, Stephen. The folks at the dictionary just felt like these represented a good list of words high school graduates “should know.” There are certainly plenty of words that the average Joe would find more useful. I hav seen ziggurat often but then I like history and it’s often seen in texts about pyramids. I don’t recall ever having seen mendacity. 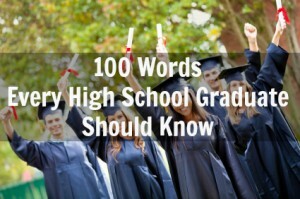 Truthfully, neither of those two words would be my list of 100 words that a HS graduate should … For that matter, at least half of this wouldn’t be there. It’s made up mostly of words that are shibboleths but not truly useful. I’m embarrassed— I only know about half these words! It’s time to read another Victorian novel, I suppose. “A Christmas Carol,” anyone? One of my favorite vocabulary stories occurred right after high school, when I sneaked into a class I had formerly taken. When one of the students recognized me and said my name, I shushed her. “I’m trying to be surreptitious,” I said. I am using your comma rules. Here is 1200 words with pictures that every 4th grader planning to go to Harvard should know. vvl.wikispaces.com Check out the Gold and silver vocabulary. Wow. I will check it out. Thanks for sharing! I noticed you have only 99 words. You omitted the word “wrought” from the original list of 100. Leave a Reply to Lisa Barfield Click here to cancel reply.